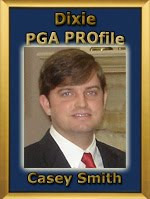 Our son, Casey, is profiled this month on the Professional Golf Association's (PGA) Dixie Section website. The Dixie Section PGA is the governing body of the PGA of America Club Professionals throughout Alabama and Northwest Florida. As you might expect, Carol and I are very proud of Casey. Please give a summary of your background and credentials. I am a graduate of the Professional Golf Management Program at Mississippi State University. While attending MSU, I held internships at North River Yacht Club in Tuscaloosa, AL; FarmLinks Golf Club in Sylacauga, AL; and Okemo Valley Golf Club in Ludlow, VT. Upon graduation in December of 2005, I was offered the position of 1st Assistant Golf Professional at FarmLinks Golf Club in which capacity I served for the first 11 months and afterwards promoted to Head Golf Professional. What was your motivation to become a PGA Professional? My motivation to become a PGA professional was the opportunity of being around the game I love and helping people at the same time. God has blessed me with a love for the game and a love for people and this seemed to be a perfect fit. The commitment of extra hours and holidays on the job make it all worth while when one sees the difference made in lives for the good. What is your specialty in the golf business? It’s hard to nail it down one area because as PGA professionals we are disciplined to specialize in most all aspects of the golf business. One specialty I consider particularly challenging is discovering what people do well and utilizing that to motivate them and cultivate their strengths. Please list any accomplishments (Awards, Certifications and Tournaments). What was your greatest moment in golf? My greatest moment in golf is the day I played golf with Butch Byrd (mentor), Jim Remy (President, PGA of America), and Ted Bishop (Secretary, PGA of America). These professionals have played an integral role in shaping me into what I am today and I am greatly indebted to each of them. What or who has had the greatest impact on your career? I have to start by saying that my personal relationship with Jesus Christ as Savior and Lord along with the influence of my family has profoundly shaped my personal life. The one person who has had the greatest impact upon my career is Butch Byrd. Not only do I consider him a mentor but the most genuine friend I have. What I appreciate most is his exemplary life and leadership style that he consistently portrays on a daily basis. He has always shown a vested interest in me and I can never thank him enough. I believe everybody needs someone like Mr. Byrd who will encourage you with praise when you are doing well but caring enough to offer constructive criticism when it is needed. Besides golf, what else do you enjoy? I always enjoy spending time with family and friends, singing when I get the chance, working out, taking care of my yard, traveling, and cheering on the Mississippi State Bulldogs! If you could play any golf course in the world, which one would it be and who would complete your foursome? I would love to play Augusta National with the Big Three (Arnie, Jack and Gary)! What is your favorite golf instruction tip? My favorite instructional tip would be using different sports as an analogy for weight transition. For example, in football, most quarterbacks who throw a pass off of their back foot will more than likely be intercepted or not have the desired results. When they properly transition their weight to their lead or front leg they will have more accuracy/consistency. The golf swing works the same way. When you properly transition your weight to your lead leg in the downswing, it will lead to more consistency and power in your golf swing.